Based on the vision of bringing the world to Taiwan, and taking Taiwan to the world, the Ju Percussion Group (JPG) has hosted the triennial Taiwan International Percussion Convention (TIPC) since 1993. Over the past two-plus decades, thanks to the support of world-renowned percussion ensembles and musicians, the TIPC has become an important venue exploring global percussion trends. 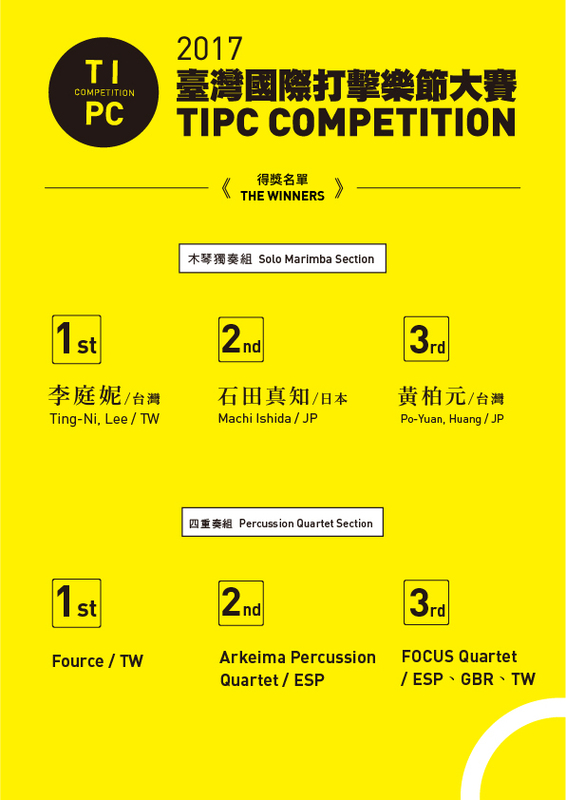 In 2017, the first Taiwan International Percussion Convention Competition (TIPC Competition) will be held in conjunction with the 9th Taiwan International Percussion Convention. To further the spirit of the TIPC, top-notch percussionists from around the globe will be serving as jury members, and new percussion talent will be featured. In addition, famed percussion ensembles from the world over will hold concerts and seminars as they conduct exchanges with their global peers. 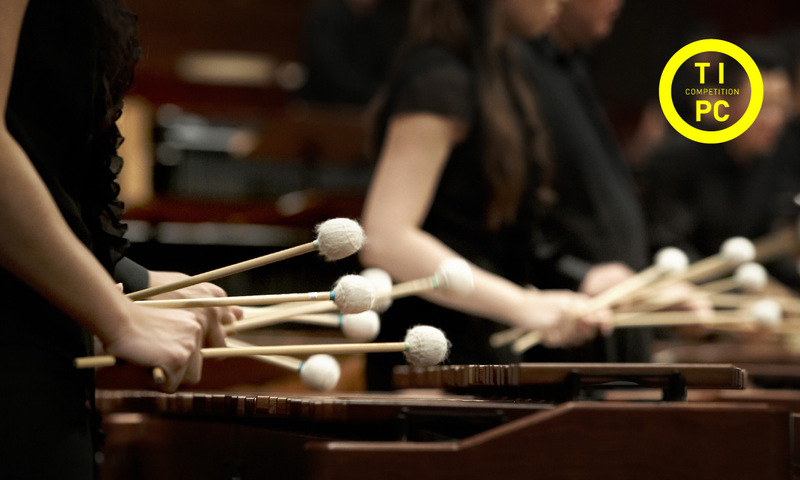 Moreover, competition winners will be invited to hold a concert at National Concert Hall, so as to showcase to the world the unlimited potential of rising percussionists. Marimba solo section: Those born between January 1, 1981 and January 1, 2004. Percussion quartet section: The total age of the four participants should not exceed 140. NT$10,000 consisting of NT$3,000 for qualification review and NT$7,000 for entering the competition, needed to be paid at once. This does not include any applicable bank fees. * See more in registration form. Please email both the registration form and a link to a video recording of 20 to 30 minutes, unedited, complete performance of the applicant’s selected piece to tipcc@mail.jpg.org.tw before 18:00(GMT+8), January 31, 2017. The shortlist will be announced on TIPC COMPETITION official website at 12:00 PM (GMT+8), March 1, 2017. Invitation will be sent to shortlisted participants by Email before 18:00(GMT+8), March 10, 2017. One assigned piece, and one selected piece no longer than 10 minutes. A commissioned marimba concerto piece designated by the organizer (participants shall receive the pdf file two months in advance), and one 10-minute selected piece. * No piece could be repeated, excepted the pieces for the Qualification review. * The instrument list will be published on the organizer’s website, including the quantity of the instruments; the brands of instruments will be determined by the organizer. A commissioned quartet piece designated by the organizer (participants will receive the pdf file two months in advance), and one 10-minute selected piece. Please email pdf files of applicants’ selected pieces to: tipcc@mail.jpg.org.tw by 18:00(GMT+8), March 31, 2017. Please bring 5 copies of each seleted composition to the organizer on the resistration day. During the competition, the organizer will arrange rehearsal studios and practice hours for each group. Participants should wear formal attire during the competition. Participants can attend all competition events and seminars with their badges, also purchase TIPC concert tickets with discount. Participants who got selected into Final Round will be awarded Finals Certificate.